What happened on October 1st? The scenes coming from Spain turn the stomach, and may turn the government. Nine hundred people injured. Blood on the streets, rubber bullets and batons. Why is this happening, and why have the state police of Spain brought their clubs down on innocent men and women? Why is brutality being unleashed on Catalonia, and why is this allowed? Is this democracy? Is this Europe? What’s going on? WHAT IS HAPPENING IN SPAIN? GIVE ME THE SHORTEST POSSIBLE VERSION. 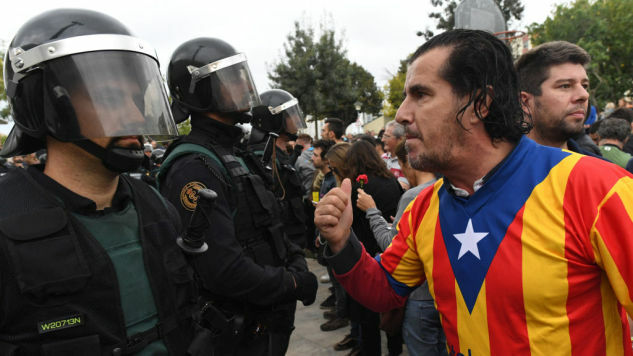 On Sunday, October 1, a region of Spain tried to have a secession vote. The government of Spain used too much force to stop them. Nobody knows what happens now. CAN YOU GIVE ME MORE DETAIL? KEEP IT SIMPLE. Catalonia is a region in Spain. The people there are called Catalans. A large minority of Catalans want to break away from Spain. The regional government of Catalonia is pro-independence. Their leader is Carles Puigdemont, who came into office last year. Puigdemont and his friends said, “Let’s have a vote.” The Spanish government in Madrid said, “That’s illegal.” Madrid is led by a fragile center-right government. This government is led by the Spanish Prime Minister, Mariano Rajoy. Catalonia went ahead and held their vote. The Times called it “Catalonia’s defiant attempt.” The key word there is attempt. Rajoy sent in state police, who beat up peaceful citizens. The police dressed in black riot gear, which made them look like the evil army in a dystopian movie. Spain was governed by a fascist dictatorship until 1975. This brings back gruesome memories for everyone. Madrid is now the shame of the world. Puigdemont has declared the government of Catalonia will now formally seek independence. WHAT DO THE PEOPLE OF CATALONIA ACTUALLY WANT? There’s not a lot of good polling. But the surveys that do exist suggest the region is divided. ... Catalans are about evenly split on the question of independence. Forty-one percent of those surveyed said they were in favor; 49 percent said they were opposed. ... In 2014, Catalan leaders held an independence referendum that they framed as an “informal” survey of the region’s mood. About one-third of registered voters participated; 80 percent of those voters expressed a desire for independence. Catalonia’s separatist parties were supported by about 48 percent of Catalans in the 2015 parliamentary elections. Parties loyal to Spain garnered about 40 percent of the vote. But Spanish loyalists are boycotting Sunday’s election. So on Sunday, most voters will almost certainly support independence, even if turnout is low. WHAT WAS THE RESULT OF THE REFERENDUM? Forty-two percent of Catalonia voted. The result of the referendum: ninety percent pro-independence. SO THAT MEANS INDEPENDENCE, RIGHT? Carles Puigdemont, the Nigel Farage of the Catalans, got his ugly way October 1. ... This was a kangaroo referendum. There is no other way to describe an exercise where voters could print ballots at home and vote at any polling booth in all of Catalonia without having to worry about their names appearing on an authenticated voters’ roll. If there were ever a Platonic ideal of a riggable, manipulable exercise in voting, it was this separatist simulacrum of democracy, designed to ensure the only result possible was a majority vote for secession. Complicating matters, the government in Madrid, fascist or democratic, has a rich, reactionary history of choking back political autonomy. The Catalans have long memories. MEMORIES OF WHAT? WHAT IS THE POLITICAL AND HISTORICAL CONTEXT? States are new inventions, only a couple of centuries old. In 1714, Catalan was conquered by Spain. It was an odd fit then, and a far stranger marriage now. In 1932, under the Spanish Republic, there was a Republic of Catalan. That didn’t last. The dictator Franco came to power in 1939, and the cause of Catalan independence was rolled back: mass executions, banning of the language, the works. Everybody in the region felt the blow. When democracy arrived, Catalonia got a degree of autonomy. In 2010, the Constitutional Court of Spain declared the Catalans were a nationality, but not a nation. And so, the divide has grown. This [secession] feeling is fed by memories of the Franco dictatorship, which attempted to suppress Catalan identity, and is nowhere more clearly expressed than in the fierce rivalry between FC Barcelona and Real Madrid, Spain’s top football clubs. A roughly triangular region in Spain’s far north-east corner, Catalonia is separated by the Pyrenean mountains from southern France, with which it has close historical ties. WHO’S REALLY IN THE WRONG HERE? The Spanish government has behaved shamefully. It’s a textbook coward-with-a-club reaction, reminiscent of how the Spanish dictator Franco acted. This is not how democracies work. DOES THAT MAKE THE REGIONAL GOVERNMENT OF CATALONIA THE GOOD GUYS? As a person On The Left, it's in my training to reject Nationalism in any form. It's almost always a destructive force. .
As Nando points out, economic hardship breeds nationalism. Far-right parties are springing up across Europe, like dragons from the bronze teeth of Cadmus. Instead of targeting immigrants like the U.S. or Britain, Spain prefers to fight with itself. Additionally, Rajoy’s government is suffering from a corruption scandal and its inability to solve the country’s economic problems. Hitting Catalonia is a first-rate way for Madrid to summon strength from its base. WHEN IS IT OKAY FOR A PART OF A DEMOCRACY TO BREAK AWAY? That’s an interesting question. The American Civil War was a theoretical discussion over the same puzzler. There are all sorts of legal answers, of course. As you might imagine, these issues are rarely settled in court. There is no amicable divorce between states. Many scholars argue that a Constitution is like a contract: if you want out, you have to get the majority’s support. Otherwise, the will of the many is frustrated by the will of the few. In reality, the process is typically a long, drawn-out experience of political discord and violent rebellions until an agreement is reached. In the case of Quebec, the 1995 referendum came after a series of failed political settlements, including the Constitution Act and the Meech Lake Accord. The Quebec sovereignty party came to power, and had a vote which Canada’s supreme court declared was illegal. As it turns out, the referendum was defeated, so the question was moot. There are other examples of states breaking away: Kosovo declared independence from Serbia in 2008, and South Sudan separated from Greater Sudan in 2011. However, those births were midwifed and negotiated by the Great Powers. Spain and Quebec are in the heart of the wealthy Western system, and that complicates matters to a ridiculous degree. Catalonia should be able to vote on their own independence, and Madrid should not stop them. That said, Catalonian nationalism is not a balm for what troubles the region. As Vila notes, self-determination is distinguishable from independence. As another Twitter user, @particleist, pointed out: You can be against separatism and also against violent attempts to suppress separatism. We don’t know what follows from Sunday. Prior to the crackdown, public polling suggested independence was not a position shared by a majority of Catalans. After the reaction by Madrid, it’s anyone’s guess. In the Old World, new solutions are needed more than ever.